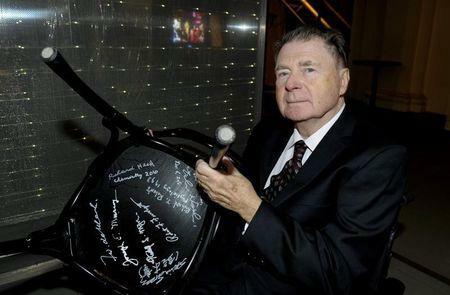 MANILA (Reuters) - American chemist and Nobel laureate Richard Heck died in Manila on Saturday after years of illnesses that left him almost penniless, relatives of his Filipina wife said on Saturday. Heck, 84, along with Japanese Ei-ichi Negishi and Akira Suzuki, won the Nobel prize in chemistry in 2010 for inventing new ways to bind carbon atoms that were used in research to fight cancer and produce thin computer screens. He was affiliated with the University of Delaware in the United States when he developed his work on palladium as a catalyst, called the Heck reaction, in the 1960s and early 1970s. The two Japanese scientists came through with their variants of the same process in the late 1970s. He retired in the Philippines in 2006 along with his Filipina wife, Socorro Nardo-Heck. Socorro died two years after Heck won his Nobel prize, said Michael Nardo, Socorro's nephew, who had been looking after Heck since his wife's death. The couple was childless. Heck was often depressed after his wife died, Nardo told Reuters. He had been in and out of the hospital since 2013, when he survived a serious bout of pneumonia. "He lost almost half of his strength after the pneumonia episode," Nardo said. Heck survived prostate cancer and had been taking medication for diabetes, chronic obstructive pulmonary disease and a slight dementia, Nardo said. Two personal nurses took turns taking care of him in his home in recent months. "It's very sad. He was relying on his monthly pension of $2,500 to get by," Nardo said. Heck died in hospital after suffering a bout of severe vomiting earlier this week.